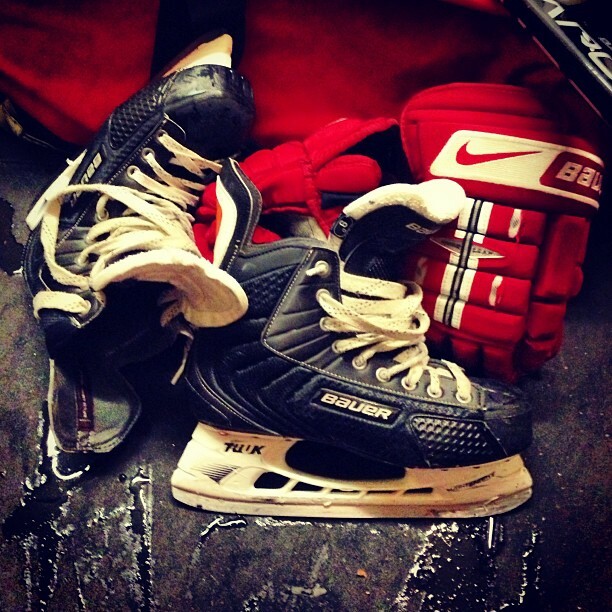 Invent The Game | Ice Hockey Systems Inc. If you’re looking for a great summer read try Ken Dryden’s book The Game, which is part autobiography, part hockey manifesto. I find the book interesting because Dryden’s hockey journey was like few others. In the middle of a hall of fame career he takes a year off to finish his law degree when the Canadians refuse to offer him a solid contract. Another unique fact regarding Dryden involves him winning the Conn Smythe trophy as MVP of the playoffs before winning rookie of the year the following season. He is the only player in NHL history to do so. As a former player and current coach what I like most about the book is Dryden’s admiration for teammate Guy Lafleur. Dryden recalls his playtime on the ice before games as essential to Lafleur’s ability to invent the game of hockey. According to Dryden Lafleur’s pre-game ritual involved taking the ice alone to find sweet spots along the boards as well as any dead areas that might cause problems. Once finished with the boards he would start his stick handling routine by simply playing with the puck, moving it between his skates and saucering passes to phantom teammates. Apparently this “messing around” before anyone else was on the ice was an expression of hockey he could not avoid from his days growing up in Thurso, Quebec playing on the pond. As early as 1983, the year of The Game’s publication, Dryden was already worried about the resistant attitude toward this pond hockey mentality. Hockey’s overall movement was toward stricter organization of youth leagues where official practice time had become dominate in the early training of new players. According to Dryden this overtly structured style created a potentially faster, stronger player who made fewer mistakes but it hurt the creativity necessary to inventing the game of hockey. To explain this idea of inventing a sport Dryden referenced the soccer tradition of Italy. According to their coaches the success of Italy’s soccer was due to the creation of space. Their players new space on the soccer field was essential to changing what was possible within the game at any given moment. Finding space and knowing what to do with it when they got there was a hard skill to quantify. For this reason the Italian coaching cadre encouraged their players to constantly “mess around” with the soccer ball outside the confines of practice. By applying this approach to hockey in his youth LaFleur’s inventing the game moment to moment backboned the Canadians to six Stanly Cups in seven years (Dryden might have had a little bit to do with it as well). Of course nostalgia for the days of pond hockey is nothing new, even in 1983. What I appreciate about Dryden’s reference though is the weight he ads to this idea of play. In other words LaFleur’s pre-game ritual was not merely an effort to feel young again. Hockey like soccer has unique qualities when it comes to creativity. Unlike the major American sports of football and baseball, (not that hockey isn’t still trying) hockey’s rule book allows for more opportunity to change strategy at the drop of the hat, and by strategy I mean the split second decisions that happen in transition especially, which is the moment that springs odd man rushes on offense or desperate back checking on defense. Transition is the moment of space in the game of hockey. Instantly the question becomes how to maintain this new space and how to find more of it. As coaches, the hard answer to this question is often, “well, that depends?” when what we honestly might be thinking is, “if I knew the answer to that I would be retired by now.” Gretzky used to say he would skate to where the puck wasn’t, and of course LaFleur was a great foreshadower of The Great One. Perhaps skating to open space was once counter-intuitive, which enabled Gretzky to blow the top off the record books (more about that later). However, this intuition is hard to teach because where the puck isn’t at any given moment in a game changes faster than Stanley Cup players in their third overtime. Truth be told, this idea probably isn’t even that new anymore. Today most defenseman know a spin-o-rama is coming when a forward enters the zone if his teammates need to catch up. In other words the game needs to once again be invented. I do realize how expensive ice-time is these days, so this is not an argument to let youth hockey turn into a three on three extravaganza. What I am asking us to consider concerns the beginning and end of practice and everything before that and after. Take the ice late or leave the ice early and encourage your players to find their own patch of ice close to their home, preferably within walking distance. If they don’t live by any lakes or ponds find the closest outdoor flooded rink. If the city won’t make sure this happens don’t be afraid to write a letter. The new hockey strategy is at stake! Finally, regardless of your reaction to Dryden’s thesis on LeFleur the rest of his book gives the rare insight into the world of professional hockey. Dryden takes care to expose the hockey locker room as well as that even darker enigma known as contract time with a care and grace that favors interesting text over outlandish indictment. Oh yeah, and Sports Illustrated called it one of the top ten sports books of all time.